Recently, the issue of inequality has regained attention in the economic and political debate. This is due to both an increase in income inequality, in particular among rich countries, and an increasing interest in this issue by researchers and politicians. In the last three decades, income inequality among rich countries increased. This period also witnessed the growth of "financial capitalism", characterised by the strong dependency of economies on the financial sector, by the globalisation and intensification of international trade and capital mobility, and by the "flexibilisation" of labour markets and the reduction of wage shares. 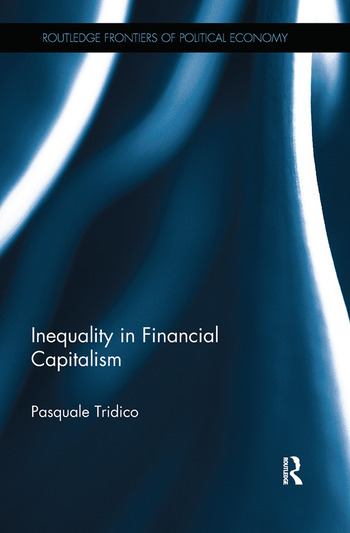 From the 1980s to the present day, this book considers the theoretical aspects of inequality (its foundations, definitions, approaches and origins) and examines empirical evidence of income inequality in a wide range of advanced economies. The key arguments in this volume are that income inequality increased during this period because labour and welfare became seen as costs to be compressed in "financial capitalism" rather than as a fundamental part of aggregate demand to be expanded. However, the welfare state is not a drain on economic performance and competitiveness, nor is it a barrier to economic efficiency. Instead, it is demonstrated that in countries that adopt "welfare capitalism", welfare state expenditure not only contributes to a reduction in inequality but also fosters economic growth. Inequality in Financial Capitalism is of great importance to those who study economics, political economy, labour economics and globalisation. Pasquale Tridico is a professor at the Roma Tre University in Rome, Italy. He is director of the two-year master’s degree in labour market, industrial relations and welfare systems and director of the master’s in human development and food security. He is lecturer of labour economics and economic policy, and is the Jean Monnet Chair of Economic Growth and Welfare Systems. He is also general secretary of the European Association for Evolutionary Political Economy (EAEPE).